Graduation day is a momentous event! 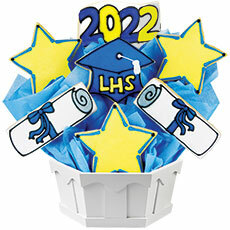 Let our selection of graduation day party supplies assist you in you planning of this event with our graduation day invitations, tableware, Personalized banners and party favors. Once you confirmed the graduation date, and celebration date, the next step is to create a guest list and purchase the invitations. A good rule of thumb is to send invitations out three to four weeks ahead of time, even sooner during the holiday season. We have wonderful selection of invitations. Throw sprinkling of confetti into each envelope to give guests sneak peak of the fun that awaits them! Proud of Your Student! Make the celebration easy when you select Paper goods that are great for Kindergarten through Graduate School celebrations. Graduation Party table centerpiece to seethe theme. Repositionable Wall Decal Wow you guests with full-sized photo of the guest of honor! They're great for graduations, birthdays, retirement parties anymore. Choose either our self-standing cardboard Standee or our Clinger Z that attaches to wall with its sticky backside.